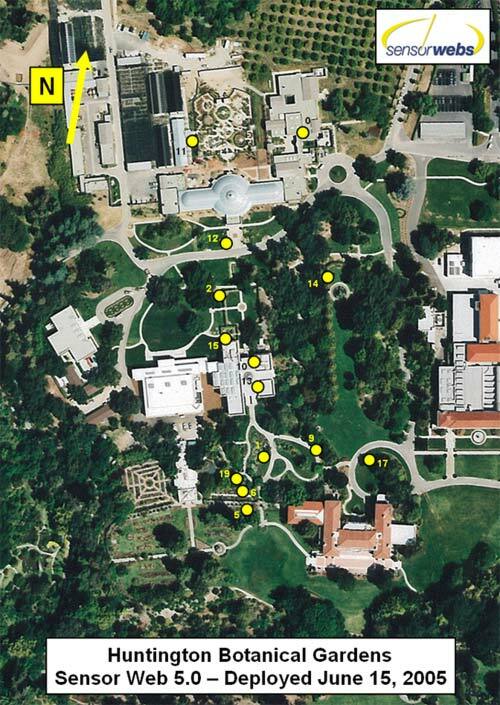 Our collaboration with the Huntington Botanical Gardens continues with the next generation Sensor Web. After a successful 2.5 year run, Sensor Web 3.1 was replaced by Sensor Web 5.0 in June 2005. This new generation of Sensor Web represents a major step forward with both the internal electronics and external packaging being re-designed from the ground-up, using the lessons learned from previous deployments. For example, power management has improved and therefore only one solar panel is now required to keep the batteries charged. The deployment of Sensor Web 5.0 is predicated on using the system to learn about botanical conditions in an urban environment. Working with Garden Director Jim Folsom, we have deployed the Sensor Web along lines that run roughly north-south. Strategic positioning of Sensor Web pods along building faces, hedges, and within dense flora will help illuminate the microclimate conditions seen by the plants as they grow. Each Sensor Web pod measures light levels, air temperature, and humidity. Most pods also measure the soil temperature and soil moisture as two depths: sensor set 1 measures at 3 inches down, just below surface level, while sensor set 2 measures 12 inches down. In addition, the pods also measure battery level, local tilt, and internal temperature which are useful quantities for diagnostic purposes. Measurements are taken synchronously across the Sensor Web every 5 minutes. The diverse suite of sensors allows for all kinds of complex environmental patterns to emerge, both locally around each pod and globally over the entire Sensor Web. Notice, for example, the correlation between local temperature, humidity, and soil moisture during watering or rainstorms. Sensor Web 5.0 also employs a new graphical user interface with three separate views: temporal, spatial, and icon. The temporal view is the strip-chart recorder-like display familiar from previous deployments. The spatial view is a dynamic map showing both the position of an individual pod within the Sensor Web as well as a particular measurement. To view the precise values of these measurements, place the mouse pointer over the pod marker on the map; the value will appear in the upper right corner of the window. Notice that the color of the pod marker is an indication of the measurement status: from the safe area of green to the extrema of red. The icon view similarly uses colors as an indication of pod status for a variety of measured parameters and can be used to monitor many Sensor Web pods simultaneously. Again, placing the mouse pointer over the traffic light pops up the measurement value. See a map [high-resolution, low-resolution] of the pod locations. View Interactive Graphs of 9 years of archived data from the fielded Sensor Web at the Huntington Botanical Gardens.